The above video is from The Shakespeare Birthplace Trust in Stratford-upon-Avon, England, birthplace of William Shakespeare. It was recorded in 2009 when the Cobb Portrait (detailed below re: Morgan Exhibit) was discovered. I thought the video would be an interesting tie-in to the current exhibit. 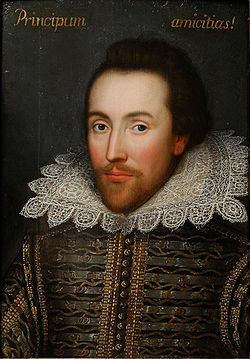 Copies of the painting we now refer to as the Cobbe portrait were identified as Shakespeare within living memory of the poet. The original was almost certainly owned by Shakespeare's only known literary patron, Henry Wriothesley, 3rd Earl of Southampton, to whom the Cobbe family is distantly related. The sitter would appear to have been identified as a playwright in the 17th century. The Latin inscription along its top edge, 'Principum Amicitias! ', is a quotation from an ode by the classical writer Horace (Book II, Ode I). In Horace's poem, the words--which can be translated as 'the alliances of princes!' -- were addressed to the tragic playwright Pollio. Horace's words warned Pollio of the dangers of writing vividly about recent major historical events (dangers of which Shakespeare was all too well aware) and contrasted the playwright's historical and tragic writings. But even more importantly, the Cobbe portrait seems to have been the model or source (through a copy) for Martin Droeshout's familiar engraving of Shakespeare for the First Folio of 1623. On exhibit at The Morgan Library & Museum, in New York City, is The Changing Face of William Shakespeare, February 4 through May 1, 2011. In 2009, when the Shakespeare Birthplace Trust in Stratford-upon-Avon unveiled a previously unknown portrait painting with strong claims to be the only surviving life-time portrait of William Shakespeare, it created an international sensation. The Jacobean painting had hung unrecognized for centuries in an Irish country house belonging to the Cobbe family. Both this portrait and a recently identified portrait of Shakespeare's patron and dedicatee, Henry Wriothesley, 3rd Earl of Southampton, were inherited by Archbishop Charles Cobbe (1686-1765). Recent technical analysis—as well as the portrait's superior quality—has established it as the original of a long series of portraits traditionally identified as Shakespeare. The Cobbe portrait has significant resemblances in costume and design to Martin Droeshout's engraving of Shakespeare published in the First Folio (1623), and bears a Latin inscription, taken from a poem by Horace, addressed to a playwright. 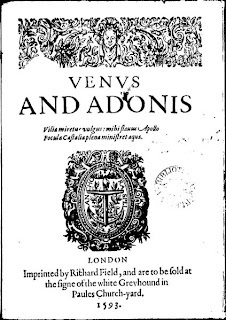 A copy of Venus and Adonis, the narrative poem Shakespeare dedicated to his patron, the 3rd Earl of Southampton, in 1593. 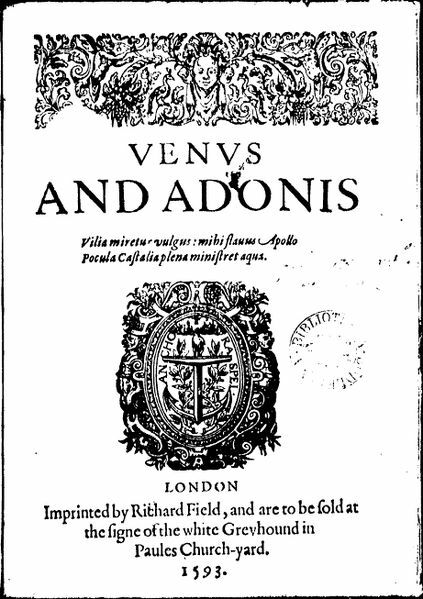 Venus and Adonis is a poem by William Shakespeare, written in 1592-1593, with a plot based on passages from Ovid's Metamorphoses. It is a complex, kaleidoscopic work, using constantly shifting tone and perspective to present contrasting views of the nature of love. Also, on exhibit is an important New Year's gift roll that records the earl's gift to Elizabeth I in 1596; the Morgan's first folio edition of Shakespeare's plays (1623); and a portrait of Shakespeare acquired by Pierpont Morgan in 1910. I cannot wait to attend this exhibit especially excited to gaze upon the signature of Queen Elizabeth I! Hope I don't faint but I know I will burst into tears! Thank you for stopping by please feel free to leave any questions or comments! Wow, I really enjoyed reading your blog! This post about Shakespeare was very detailed. I learned alot! Wishing I lived in NYC so I could see this exhibit! Hope you'll post a follow up! Let us know how it was. Welcome and thanks for the wonderful comment Courtney! It's always good to learn new things or find something new in something old!